Father's Day is right around the corner. Do you know what you're getting Dad? Another tie? Another wallet? Personally, I always have a hard time picking out gifts for my dad. So I usually go the safe way, and get him the same thing every year. Why not surprise Dad this year and let HIM pick out what he wants! Gift cards are the perfect solution for this. And to make it even more perfect, you can now buy his gift card for up to 35% off! Plastic Jungle offers HUNDREDS of gift cards to the most well-known retailers at discounted prices with FREE shipping! Have a techie dad? Get a Best Buy gift card for 5% off. How about a do-it-yourself kind of dad? Give him a Home Depot card for 7% off. Fandango cards are going for 30% off! Check out the screenshot below to see how much you can save. For those times you need a last minute gift, you can purchase eCODEs. No need to worry about shipping delays. As soon as your payment clears, the code will get emailed to you. You can then print it out and put it in a card, or email it to the recipient. And with eCODEs, you can use a merchant's coupon code or free shipping offer to save even more money! You can also SELL gift cards on Plastic Jungle. I know I've had gift cards given to me, that I wind up giving away to other people because I will never use them. Well, next time I'm going to sell that gift card and get something for it! 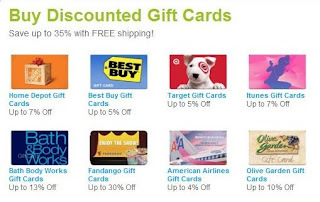 With Plastic Jungle, you can sell your gift card for up to 92% of its worth. They offer 4 different payment options: PayPal, check, Amazon code, and charity donation. For example, you can sell a $25 Applebee's card and get $20 in PayPal money or check, or $21 worth of Amazon codes. The selling process is free and simple. All you have to do is print out a pre-paid shipping label and mail it out. Go to Plastic Jungle for all your gift cards needs. Save AND make money, what more could you ask for?! $25 gift card to Walmart, Target, Lowe's, Home Depot, OR Sears! Mandatory First Entry: Tell me which gift card would you choose if you won! Extra Entries: (Available after mandatory entry is completed. Please leave separate comments for each entry).
" Enter to #win a $25 gift card of choice from Plastic Jungle! #giveaway Ends 6/1 http://tinyurl.com/64hbce6 "
Giveaway will end on June 1st at 11:59pm EST. The winner will be chosen be Random.org and emailed. Winner has 48 hours to respond to email before a new winner will be chosen. Make sure you leave your email in comment or make sure it is visible in your profile so I have a way to contact you if you win! This giveaway is open to US residents only. I received a $25 gift card from Plastic Jungle in exchange for this review. Sears, I would definately choose Sears! I think I will choose a Best Buy gift card if I win. I'd love the Walmart gift card. I subscribed to your blog via email. I would LOVE to get a Home Depot Card. I would get the Target one! If I were lucky enough to win, I'd choose a Sears card! Thanks for this generous opportunity! I would choose Walmart gift card. I would choose a best buy gift card. follow Plastic Jungle on FB. Subscribed on RSS Google reader. I would choose Walmart if I won! I would choose the Target gift card. I would choose a target gift card. I am a GFC follower (coliebear). Today's Best Daily Deals at a Glance! Click Here!